Villains skulking in the night, a deadly firearm snuggled down for ready access, leave mayhem and death across a 600 square mile metro area. Some 47 targets later (human, animal, property), the story ends in handcuffs and shackles and the revealed faces of serial killers. How did these faces, the dejected, brooding face of Sam Dieteman and the impertinent, scheming one of Dale Hausner, 47 times contorted in the glee of secret destruction, how did these faces develop out of what was once the innocence of childhood? The British TV show, Born to Kill? came to the desert this week to delve into the eternal question of Nature vs. Nurture in the formation of serial killers. 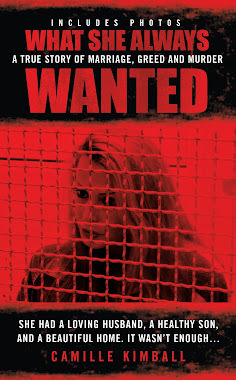 The show airs as Twisted in the U.S. 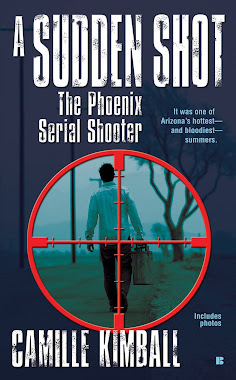 The British producers based this episode on my book, A SUDDEN SHOT: THE PHOENIX SERIAL SHOOTER. TwoFour producer Greg shows off my book while Paul shows off his lipstick mark! It was certainly a pleasure to me to see Greg from England clutching his own dog-eared copy of my book. When the show first contacted me, the lovely English accents coming down the phone line spoke reverentially of the character they had gotten to know through my pages, serial killer survivor Paul Patrick. Would it be possible to meet him, they asked? Knowing how much Paul gets out of each opportunity to tell his story and radiate the spirit of triumph, I was glad to pass along the invitation. TwoFour Studios producers Tom and Greg set up a nice lighting effect for Paul's interview . Tom, seen behind Paul's bed in this photo, and Greg were awed by meeting Paul. They shook his hand and told him how grateful they were to hear him speak. Regular visitors to this blog or to the A SUDDEN SHOT FB page know that this has been a very difficult year for Paul. He has never regained his former stamina after yet another major surgery and brush with death in January of 2012. Paul screwed up all his concentration, fighting through his many medical debilities, to give Greg and Tom the best account he could of his ordeal. The Brits found it amazing that Paul could be so open but by the end of the interview understood that, finding purpose in catastrophe, Paul considers it his mission to tell the story. And then they got a great giggle when Paul's face lit up as he spotted me drawing out my tube of red lipstick after their camera finally stopped running. In our tradition of several years, I gave myself a fresh coat and then performed the Ritual of Planting the Forehead Lipstick Kiss. This is most often performed with just Paul and me in attendance. It was fun to see the reaction of this international audience of 2 as they witnessed Paul's vividly happy anticipation. I had my own time in front of the camera a bit earlier than Paul did. The House of Broadcasting, Inc. on 5th Avenue in Old Town Scottsdale was invaluable. 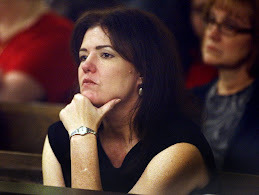 So much thanks to Mary Morrison for her help. It was a pleasure to have her on set. She was even kind enough to remember that I was one of the first to give the museum publicity back when she first created it and I was a columnist for the Arizona Republic. Hey, I see a KOY sticker on the wall behind Tom. I used to work there, too! This is the first time one of these TV shows that I have done has focused on the question of Nature vs. Nurture. It was interesting to contemplate. Is there something essential simply broken inside the soul or brain of a serial killer that no intervention could affect? Or do situations in early childhood or at other points in life "create" an irredeemable villain? In Dale Hausner's case, there's a particular incident in his early adulthood that the producers wanted to talk about. I'll let you know as soon as I know myself when and where the show will air. It will be in both the UK and US, so chances are many of you will get a chance to see it. In the meantime, which side of the question do you come down on? Nature? or Nurture? I'd love to hear your ideas in the comments below.